When architecture, engineering and construction professionals need a quick and easy way to render CAD designs into striking visual displays, they turn to Lumion. The software allows users to transform models into richly textured renders and even make real-time alterations to designs. Lumion is a widely used software among AEC professionals because of its ability to render intensely realistic building interiors and exteriors. Users can also create lush landscapes of hundreds of trees and animate humans interacting with their models, which helps to bring models to life for clients and other collaborators. Functionally, Lumion is compatible with a host of other CAD applications, making it a versatile tool for fast and high-quality rendering. Though Lumion requires little training to operate beforehand, AEC professionals must have a high-powered workstation to ensure they're able to maximize the software's potential. When viewing a Lumion-rendered model, it may come as a surprise to some that they aren't watching real-life video. The visuals are so realistic, textured and smoothly animated that it makes interacting with Lumion almost like playing a high-end PC game. Indeed, like those games, Lumion works best with a graphics card posting a PassMark score of 6000 or higher (e.g. NVIDIA GTX 1080 and GTX 1070 GeForce). But graphics cards aren't the only hardware components AEC professionals need to optimize. They also need a Lumion workstation that's configured to support single-threaded workflows and high viewport frame rates that enable such realistic visuals. As opposed to multi-threaded tasks that benefit from more CPU cores, Lumion workflows benefit from increased CPU frequency. A Lumion workstation to consider is the 5.1GHz APEXX S3 featuring eight CPU cores and support for up to three professional GPUs. Because Lumion can be effectively used alongside a number of other CAD modeling applications, AEC professionals can simultaneously edit Lumion visualizations as they make changes in BIM software, even after they've spent time adding textures and materials. Of course, when using applications side by side, it's important to remain aware of the potential compute bottlenecks that may result from such a configured workstation. Both Lumion workflows and BIM workflows are single-threaded, and thus frequency bound - meaning the number of CPU cores doesn’t affect performance. AEC users can address these needs by looking at the overclocked, six-core APEXX S3, a system designed to accelerate both creative workflows. Our GoBOXX mobile line has a number of workstations that fit functional and computing needs. 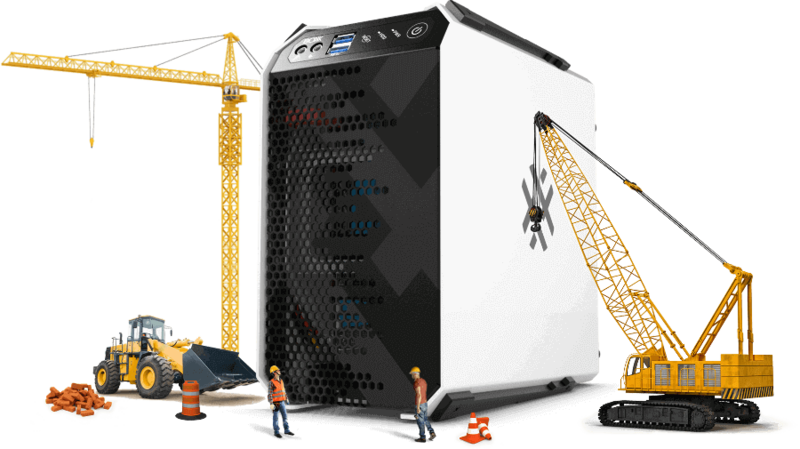 The 2.6GHz GoBOXX SLM VR features six CPU cores and is the lightest, thinnest Lumion workstation available, while the 3.7GHz GoBOXX MXL VR (with an Intel® Core® i7 processor and 64 GB of storage) is the perfect desktop replacement.